Are you a funder interested in helping your grantees build capacity? Welcome!! At CORE, we are committed to ensuring that philanthropists, grant makers, and donors of all sizes are an integral part of the CORE community, and we hold programming specifically for funders to learn from each other and build community to strengthen the social sector in Dane County. Reviewing harvests from past gatherings. Please contact us to find out about our next Funder Confab, and to explore the possibilities! Participate in our learning community by attending the next Funder Confab! The thoughtful funding of capacity building projects is a key ingredient for their success. 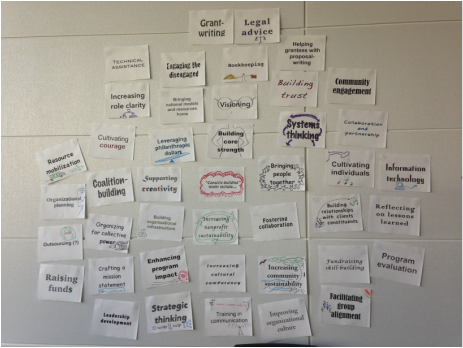 Here is an image from one of our Confabs, showing the myriad ways funders support organizational capacity building. Funders are also welcome to support CORE's programming financially, and/or to give capacity-building grants to organizations through CORE. DONATE NOW TO SUPPORT CORE! We love to share what we're learning. Here are some highlights from past Funder Confab gatherings.